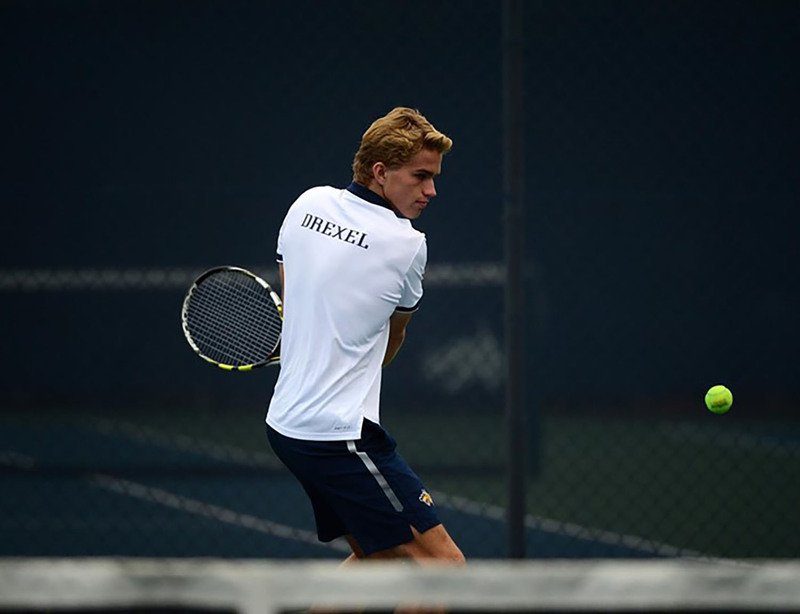 The Drexel University men’s tennis team got to an 8-8 record after losses against teams such as the University of Pennsylvania (Photograph courtesy of Sideline Photos). Despite their impressive mid-season run of eight consecutive wins, the Drexel University men’s tennis team closed out March with a string of four losses in a row, evening out to 8-8 overall. In the span of three weeks, the Dragons faced the University of Pennsylvania, St. John’s University, the College of Charleston and the University of North Carolina at Wilmington. Drexel took to Penn’s Hecht and Hamlin courts March 10 in a rivalry match against the Quakers. Though the courts serve as Drexel’s home courts during the indoor part of the season, they were designated as the visitors on the occasion. The Dragons fell to their Philadelphian neighbors 5-2, earning wins at third doubles as well as the fourth and fifth singles spots. The pairing of junior Youssef Lahlou and freshman Juan Manuel Sanchez took the sole win for Drexel in the doubles matches. Sophomores Xandy Hammitt and Sanil Jagtiani, while unable to take their doubles match, each emerged victorious in their individual efforts at singles. Up next for Drexel was St. John’s, a match up that saw the Dragons return as hosts at the Hecht and Hamlin Centers March 16. Sanchez and Lahlou were paired again to great effect at third doubles where they worked hard to secure a close 7-6 win over their opponents. The first doubles space was occupied by freshman Gustav Wogen and senior Sinan Orhon, who bested their opposition 7-5. The win put Drexel ahead on the doubles aggregate, bringing the Dragons up 1-0 overall. While the outcome of the doubles matchups showed great promise for Drexel, the Dragons lost in each of their singles matches, ultimately granting St. John’s the match with a 4-1 final score. Competing for Drexel at singles were Orhon, Wogen, Lahlou, Jagtiani, Hammitt and junior Alvaro Cruz Chamorro. Orhon and Jagtiani did not finish their matches while the rest of the Dragons lost in straight sets. March 28-29 had Drexel pitted against Charleston and UNCW, respectively. Drexel dropped the contest against Charleston 5-2 in a match that saw wins from Hammitt and Lahlou at singles. The duo of Orhon and Wogen earned Drexel’s only win at doubles. Drexel had to make the quick turnaround to face UNCW in a Colonial Athletic Association league matchup a day after their loss to Charleston. Unfortunately for the Dragons, their performance was no better their second day of competing, as they went winless at each doubles and singles spot. The final point tally was 7-0 in favor of the Seahawks. The highlight of the day for Drexel was Orhon and Wogen taking the lead at first doubles before having to leave the match unfinished as a result of behind on doubles aggregate. Although the outdoor part of the season has already kicked off for Drexel, the Dragons had their first true home match of the season on their very own outdoor Vidas Courts. Drexel made their home outdoor debut against Saint Joseph’s University April 4. The tennis squad will be keen on making the opener a winning one, as they hope to build momentum going into the CAA tennis championships.